Are Food Allergies Serious and Legal Issues? Food allergies affect approximately 15 million Americans, including one in 13 children under 18 years of age, or two children per school classroom. Furthermore, food allergies have increased about 50 percent between 1997 and 2011 per the U.S. CDC study released in 2013. Something that needs to be pointed out is that escalating allergies are concomitant with the increase in the number of vaccines mandated for children. Is that a coincidence, as they say about adverse reactions after vaccinations? 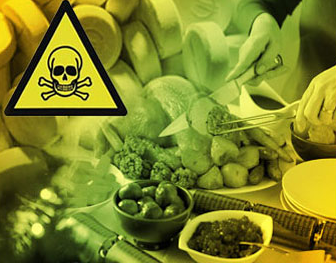 Less severe food intolerance reactions e.g., hives, rashes, diarrhea, upset stomach, and other minor symptoms, including fingers or feet swelling, and urinary tract discomfort. Foods that cause the most reactions—approximately 90 percent—include peanuts, tree nuts, wheat, milk/dairy, eggs, soy, shellfish, fish—and any edible containing them as ingredients. The only known treatment for food allergies is total avoidance. Most ready-made, restaurant-size, commercial catering foods contain wheat, dairy, soy, and egg ingredients. Plus, food additives, colors, and preservatives! Therefore, college cafeteria foods place students at risk, so either they forgo eating, or experience allergic reactions. “Food allergies may constitute a disability under the ADA,” according to the settlement between the college and the feds. The DOJ claimed that Leslie University did not supply enough gluten-free food so students could eat gluten-free and/or enjoy eating with classmates. Allergy-free eating is a serious issue that should be leveled against all schools, colleges, and universities, since gluten intolerance is becoming ‘pandemic’, it would seem. Perhaps, culinary arts courses at every level of education and certification ought to have a semester steeped in preparing gluten-free foods and learning how to substitute high allergy ingredients in recipes as part of any professional chef training and certification curriculum. Concern is growing that a trend will be in the offing to make more gluten-free foods available in restaurants and other places that serve food. That’s not a bad idea, frankly. Also, I think it may be a blessing in disguise for getting the public, in general, to have a better and healthier selection of food to eat, especially in fast food restaurants. Supermarkets caught on and now have gluten-free sections. Moving along that continuum, how will the DOJ deal with those folks who suffer allergic reactions to genetically modified foods and foods made with them? I know of some folks who blow up to the size of a six-month pregnancy after eating GMO canola oil. That, alone, should be a prime reason for GMO food labeling, in my opinion. Attorneys ought to be looking at launching class action law suits based upon violating Title III of the Americans with Disabilities Act. If it works for gluten issues, it should work for GMO issues. Or, is that why Monsanto sought what was known as “The Monsanto Protection Act” that Senator Jon Tester of Montana “is being lauded for ending a law that ordered the U.S. Department of Agriculture to ignore judicial bans on genetically modified crops….” A similar ‘dispensation’ is what the vaccine makers got from the U.S. Food and Drug Administration and Congress, and Monsanto obviously coveted that legal protection status. Personally, I think the DOJ’s interpretation about food allergies is correct. If food allergies are considered a disability, then people suffering with Multiple Chemical Sensitivities (MCS) need to be treated ethically by society, including the medical profession and the law. Anywhere between 12.6 and 33 percent of U.S. citizens in the 1990s  suffered with MCS. It is now 2013 and who knows what the percentage is. For those who need an understanding of what MCS is, please see this. This website provides ‘super-important’ information regarding MCS housing issues. With all the chemicals humans are bombarded with daily, especially since infants now are mandated to be injected with toxins starting at birth (Hepatitis B vaccine), and then at 2, 4, and 6-month well-baby visits with additional numerous neurotoxic multi-valent vaccines and vaccinations, the human immune system is experiencing ‘catastrophic meltdown’. Those glitches are manifesting as chronic diseases and allergies because what’s being impacted is the immune system triggering responses to a wider range of agents such as foods, just not certain diseases, and is placed in a constant immune response triggering state due to immunologic adjuvants in vaccines. To understand more about immunity, please read Wikipedia’s Immune System. 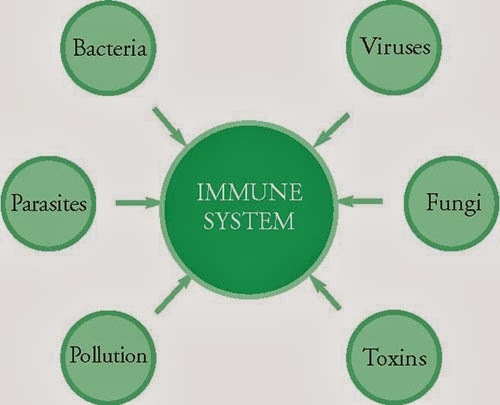 As you can see by the above graphic, toxins affect the immune system. Vaccines contain more neurotoxins than you probably know or can even guess. 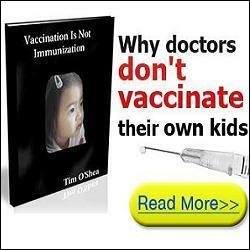 To learn about the wide range of toxic vaccine ingredients, you may want to read my latest book, Vaccination Voodoo, What YOU Don’t Know About Vaccines. More and more allergies will become evident, all while modern medicine continues with its petrochemical and neurotoxic paradigm of health and healing. Our bodies are telling them we cannot tolerate toxins. Our children’s health is getting worse with chronic diseases at earlier ages and infant death categories such as “Sudden Infant Death Syndrome”, i.e., SIDS. The time has come to re-evaluate health, especially the healing paradigm that seems to be very flawed when it comes to injecting toxins/poisons into the body to prevent illnesses, especially in newborns, infants, and toddlers under the guise of prevention or prophylaxis. What do you think Hippocrates, who said, “first do no harm”  would say?